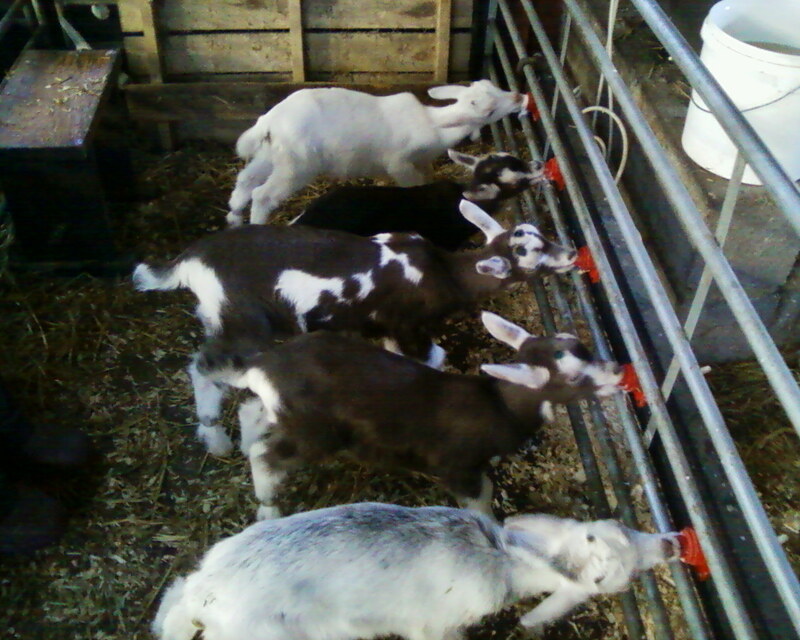 Here's some of our older babies feeding themselves on the automatic feeder. After they come off mum, they are bottle fed for a few days until Francesca is happy that they are feeding well. 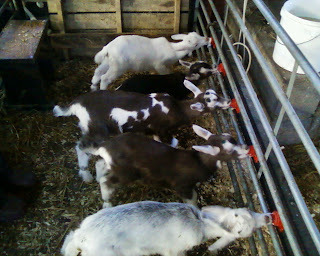 Then she teaches them to feed off the automatic teats - and away they go! This is quite an orderly session - quite often they will spend more time swapping places than they do feeding. True goat behaviour - someone else's teat is obviously much better and more interesting than your own. And here's another foster mum - Cilla. The little white girl needs a bit more attention but her own mum is not interested in her. So, during the day, she curls up with her sister but when it's feeding time, we find another mum who is willing to feed her. And, as you see, Cilla is more than happy to oblige! 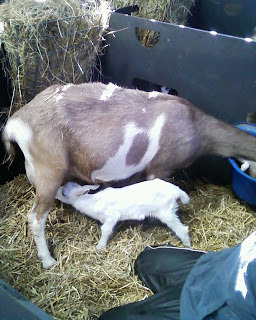 Cilla only has one kid of her own and so there is plenty of milk to go round. Milking time is proving to be a bit of a challenge again now that we have a lot of new girls and some of the old naughty ones coming back in. This morning we had a rerun of the old '13 goats in the parlour' routine as Ellie and Pixie decided that they both wanted to be in the first stall. Fortunately, they are both quite slim! And spare a thought for Florence who probably has the largest udder in the barn. She had mastitis a few years ago and so has a bit of a wonky udder but it still takes an awfully long time to get all that milk out!